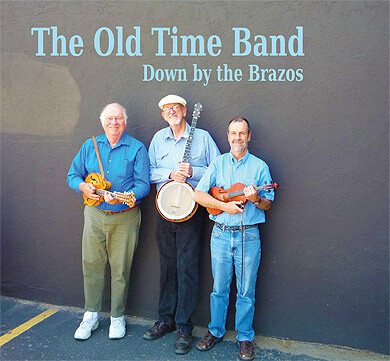 HC-506 "Down By The Brazos"
The members of the Old Time Band share an enthusiasm for history, a disdain for musical boundaries, and a love of performing. They are an ephemeral entity, appearing hither and yon, coming and going when least expected. They enjoy sharing their music at festivals, clubs, and concerts. Who knows? If you purchase this CD, they may come visit you in the sanctity of your own home! Sorry, your browser doesn't support the HTML5 Audio element. Peter Feldmann, mandolin and guitar, and Wayne Shrubsall, banjo and guitar, may not be household names across the nation, but these two gentlemen have been on the scene in various capacities with numerous groups in the southwest and California. Fiddler Bruce Thomson has been in a band with Shrubsall for thirty years and now is also in this group. They blend a great respect for the traditional American songbook with a strong disregard for categorization of this same music. In this 14-track project, we are treated to blues, cowboy songs, bluegrass, and old-time fiddle tunes. The depth of knowledge is evident as these men play and sing with conviction. They play “Katy Hill” in an old-time style, except there is no guitar, and the fiddle, clawhammer banjo, and mandolin all take breaks. The absence of bottom end makes the tune float along very nicely. Then they tackle “Hot Corn, Cold Corn,” the old Flatt & Scruggs favorite. Their spirit is very good and similar to the original version. They opened up a favorite old blues, “Somebody’s Been Using That Thing,” that comes off well, if not as ribald as some of the older versions. They visit repertoires of many of the old-time greats such as the Delmore Brothers, Grandpa Jones, and Fiddlin’ Arthur Smith. The trio medley of “Robinson County”/“Mississippi Sawyer”/“Oklahoma Rooster” not only covers a lot of geography, it demonstrates Thomson’s fine fiddling. Feldmann, who handles the bulk of the leads, is unpretentious as a singer in the old folk-singer tradition. The depth of material is bound to please, as there are blues and humorous songs side by side by side by side in this entertaining project. There is a high level of musicianship, the picking solid, but not showy. The material is cherry-picked from the wealth of older recordings, reflecting the eclectic tastes of this trio.